Following a recent special ceremony held in Bejing celebrating the landmark sales of 10 million copies of Atlantyca Entertainment’s Geronimo Stilton books series by 21st Century Publishing House in China, Atlantyca’s CEO Claudia Mazzucco, whom also heads Atlantyca China, the business unit based in Beijng, has announced that it has partnered with China’s PumpPush Creative, securing a distribution agreement for audiovisual rights to the TV series in addition to the respective licensing and merchandizing rights for the animated series or the classic rights? The celebration for the outstanding book sales took place in the (Radisson Blu Hotel Beijing), with special guests vice president of China Writers Association Gao Hongbo; former vice president of The Publishers Association of China, former president of Chinese Board on Books for Young People Hai Fei; well-known children’s books promoter, author, Shanghai Normal University Professor Mei Zihan. Thanks to this success, 21st Century Publishing House has reached in a few years the 4th place in the worldwide ranking the most famous Geronimo Stilton publishers in the world . Invited to take part in the celebration ceremony was The cermonial event was held one month after the presentation of the annual Italian China Awards, honoring and recognizing those Italian companies who have best taken advantage of opportunities offered by the Chinese market and the Chinese companies who have best seized opportunities offered by the Italian market. At the China Awards, Atlantyca was bestowed the Value Creators Category Award – Children’s Products/Content Sector, again proving itself to be the leading company in business development throughout the entire Asian area. Atlantyca CEO Claudia Mazzucco, already winner of the Capital Elite Award for Women in Management at the 2010 China Awards, had this to say: “the sales results of Geronimo Stilton books in China, achieved by 21st Century Publishing House, are amazing and a source of great pride for us. It also goes to prove just how much China is on the lookout for children’s products branded ‘MADE IN ITALY’. 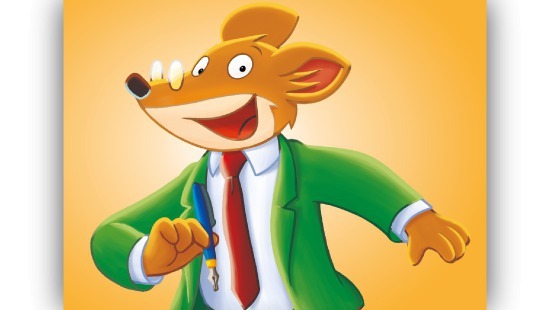 This is why we are so enthusiastic about the new partnership with PumpPush, a deal sealed by our distribution manager, Alessandra Dematteis, that will allow our tv series to reach Chinese children and make Geronimo Stilton even more popular in China. Mr Xiong Chi, the Vice Chief Editor said : “The beauty of Geronimo Stilton is that each enchanting story within this series delivers positive values, such as honesty, courage, kindness, love for nature and so forth. Such positive values shared by people from all around the world can help young readers to make their own kind of values that help them make positive choices throughout their lives. Through all these years, ‘Geronimo Stilton’ has grown into a well-developed IP in China. Considering the excellent reputation and the great sales of the Funny Tales, we also signed the other two series from Atlantyca, which are Superhero series, and Travel through Times.” “With China in the map,”Yujie Yang, the CEO of Pump Push said that,” As a long-time fan of the Geronimo Stilton series, I am thrilled to be partnered with Atlantyca Entertainment on this world-renowned IP. Not all of the companies know us because we are a start up. But we can do big things with great creativity and enthusiasm. We have strong confidence that this partnership will lead one more successfull story in China market”. Atlantyca, founded in Milan in 2007, has been playing a leading role on the International market for a decade, distributing hundreds of stories ‘Made in Italy’ all over the world, with the Beijing business unit making over 1300 deals with 80 publishers.